Who says caramel apples are just for fall? This delicious spiced cake, is super moist from the applesauce baked in the batter and extra tasty from the toasted Pearson Farm pecans mixed throughout. Serve it at your next summer event and you will instantly be reminded that cooler fall weather is just around the corner. Preheat oven to 325 degrees F. Grease two 9 inch round cake pans, line the bottoms with parchment paper, grease and flour the parchment, tapping out any excess flour. In a large bowl, sift together the flour, baking soda, baking powder, salt, cinnamon, allspice and cloves. Using an electric mixer on medium speed, beat the butter until creamy, about 4 minutes. Add the sugar and beat until light and fluffy, about 3 minutes. Add the eggs, one at a time and beat until combined. Reduce the mixer speed to low and add the flour mixture to the bowl in three parts, alternating with the applesauce, beginning and ending with flour. Scrape down the sides and bottom of the bowl after each addition. Divide the batter equally between the prepared pans and tap lightly on the counter to release any air bubbles. Bake about 50 minutes or until a toothpick inserted into the center of the cake comes out clean. Transfer the pans to a wire rack and cool for 20 minutes. Turn the cakes out onto the rack, remove the parchment, and allow to cool completely. Trim the top of each layer to create flat surfaces. Place one cake layer on a serving platter and spread with 1/2 of the buttercream. Place in freezer or refrigerator for at least 10 minutes. Top with a thin layer of caramel sauce and toasted pecans. Add the top cake layer and frost with the remaining buttercream. Refrigerate again before adding a layer of caramel sauce on top. Sprinkle with the remaining toasted pecans. Refrigerate until ready to serve. In a medium saucepan, whisk the sugar and flour together. Add the milk and cream and cook over medium heat, whisking until the mixtures comes to a boil and has thickened, about 10 to 15 minutes. Transfer the mixture to the bowl of a standing mixer fitted with the paddle attachment. Beat on high speed until cool. Reduce the speed to low and add the butter and vanilla and mix until thoroughly incorporated. Increase the speed to high and continue mixing until it becomes light and fluffy. Add the caramel sauce and mix again. Refrigerate at least 15 minutes before using. Add the sugar to a large heavy saucepan. Heat over medium-high heat, whisking. The sugar will begin to form clumps as it starts to melt. Stop whisking once it has completely melted. Continue cooking until the sugar has reached 350 degrees F. This can happen quickly so be careful. As soon as the caramel reaches temperature, add the butter all at once and whisk until completely melted. Remove the pan from the heat and slowly pour the cream into the caramel and whisk until it is all incorporated. Set aside to cool for at least 15 minutes before using. I have an ongoing relationship with Pearson Farms and receive product and/or compensation for posts featuring their items. As always, all opinions are 100% my own. This looks SO delicious and what a special dessert to have in mind for a celebration! Love Pecans!! That is absolutely gorgeous and so tempting!!! Bring on the fall flavors with this gorgeous cake! I eat caramel apples all year long! Love! This cake looks amazing. So much going on here. 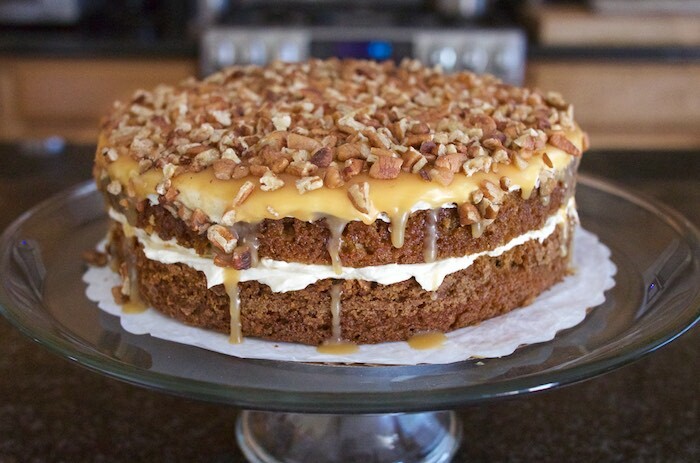 Love the caramel buttercream, yum! I adore pecans! This cake looks so delicious. Look at that gorgeous caramel glaze! This cake looks phenomenal. I definitely won't be able to wait until fall to give it a try. Oh goodness this sounds amazing! My hubby would love to see this in our kitchen sometime soon! Whoa! This CAKE! I want this for dessert ASAP! oh my! That is one stunning cake!! Your gorgeous cake will be my feature at this week's Let's Get Real Weekly Link Party on Thursday Nov. 3rd. I can't wait to see what you link up this week.